The ailes at Più Libri Più Liberi, the book fair for small and medium publishers. 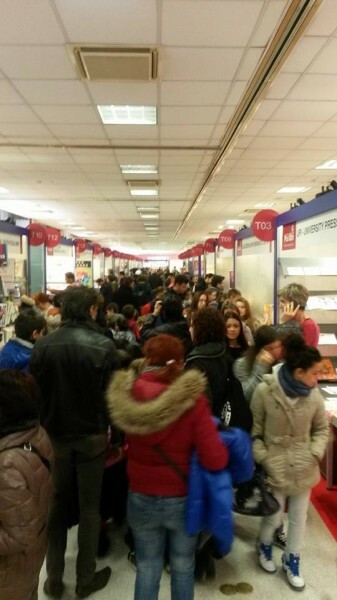 ROME: Readers, professionals and publishers met in Rome this past December for the 12th annual Più Libri Più Liberi, the book fair for small and medium publishers. Taking place in the magnificent Palazzo dei Congressi, the fair is a ‘can’t miss” event for Rome’s readers and for the Italian publishing industry. 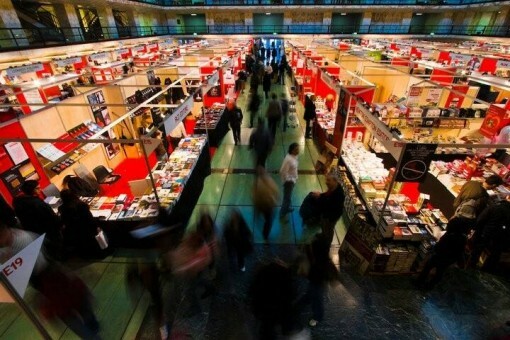 This year saw the presence of some 370 small and medium publishing houses, while the organizers, the Italian Publishers Association, arranged a 150 events inside and outside the main venue. As such it is an ideal occasion to reflect on the Italian publishing world and the role played by the books and the bookstores in a country that is going through the worst economic and political crisis of the last several decades; it is a situation so bad that it has prompted many to describe Italy as a “lost country”. Rome’s book fair is a complement to the other main book event in Italy—the Turin International Book Fair which runs every spring and gathers big and small sized publishers from all over the country. There are many differences between Turin and Rome and it’s not only about geography. The last Turin book fair looked more like a giant supermarket than a book fair: the books were showcased alongside an increasingly bizarre range of goods, from ice cream to hams. The booths of the big publishing houses like Feltrinelli and Mondadori, particularly when they were hosting book signings with some of their leading writers, simply overwhelmed those of the rest of the publishers. Who wants to buy a ham at a book fair? Well, apparently, these people do. 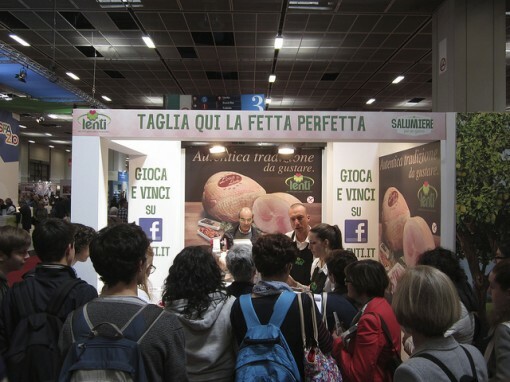 While in Turin it was the presence of the extraneous stands selling, well…ham, for example…that were most fiercely criticized, in Rome the so-called “paid publishers” (those who paid for admittance, rather than were invited) who drew criticism. Representing only 30 out of 370 stands, their presence was difficult to spot without having a professional background in the Italian publishing industry, but the situation was noted by numerous publishers and journalists. Pietro del Vecchio also contributed to deepening debate on the role of the book fairs in Italy which started last July by literary critic and L’Indice editor Federico Novaro on his own blog. The post titled “Fairs and salons, we had enough. Thank you very much” argued that the book fairs do no good for books or for readers. The piece attracted much attention by other book experts. It became a regular column under the title of “Fieri delle fiere?” (a wordplay impossibie to translate in English which means “Are you proud of the fairs?”) which features other contributions from publishers and journalists. The publishers interviewed were cautiously optimistic about the Rome fair and appeared quite satisfied with the sales. For the majority, being in Rome is important both in terms of visibility and books sales and because they have the chance to meet “their” readers who go to the fair to find them and their books. Although some concluded that this is simply a tough time for the independent publishing industry, much of feels excluded from the mainstream channels of book distribution and promotion. The publishers had no shortage of customers. According to the Rome book fair organizers, some 54,000 readers attended this year’s event— a small step forward when compared to the 50,000 visitors in 2012—but one that does not necessarily indicate a new preference towards books, which as a recent infographic on the relationship between the Italians and reading demonstrates, is in decline. Nevertheless, the publishers in Rome did their best to attract the attention of the visitors who wandered distractedly through the numerous aisles of the Palazzo dei Congressi. One publisher promoted the idea of “books in head,” a campaign that was a play on hairdressing salons; another offered chocolates from Piemonte, while yet another displayed vintage typewriters. Sometimes the pitches worked: one publisher reported selling 15 titles to a single buyer. These are, of course, the same readers who prefer to buy books in the indie bookstores, now menaced by the economic crisis which which has forced so many stories to close. But if the small bookstores closes, it becomes more and more difficult for the small publishers to reach the market. The big chain booksellers, like Mondadori and Feltrinelli, which dominate bookselling in almost every Italian city (for example, Rome has 10 Feltrinelli bookshops), sell everything from books to electronics to stationary, yet often exclude small publishers. And with further consolidation, this situation is becoming worse. The Pde group, our retailer is abandoning us,” said Anita Magno, “it is difficult to find our books even in the Feltrinelli bookshops, and Pde and Feltrinelli now are the same thing” (Feltrinelli acquired Pde, a big national retailer, in 2008). What can indie publishers then do to expand their market? The only approach is to apply intellect and creativity. Some organize open meetings and debates with readers, writers and intellectuals; others try to “make the books walk outside the bookshops”; still others work at publishing “smart books that are also beautiful objects.” Publishers have to innovate. Enlarging the space through the social media is one example worked. “It is the culture that drags the economy and not the opposite,” admitted one publisher. Also, in order to promote reading, the Government recently announced a tax break on print books — a measure that since it was also targeted at supporting independent booksellers, excluded ebooks (which, inevitably, sparked controversy and debate in the media). It is still too early to say if this step will affect positively the reading habits of the Italians and if will help the indie booksellers. Looking around the the Palazzo dei Congressi during the recent fair, my eyes were filled with a heartening vision: that of the hundreds of readers, adults and children walking down the aisles looking for their favorite books, queuing for the book signings, and talking passionately with the publishers. As seen from the book fair, despite everything, Italy did not really look like a lost country at all. Instead, it looked like a country that needed a good distraction from its troubles. Chiara Comito is the founder and editor of editoriaraba, a blog dedicated to covering Arabic publishing news in Italian.